LOCATION: Field research on sea oats and American beachgrass was conducted at the Castle Hayne Research Station. Greenhouse research on sea oats, bitter panicum, seabeach amaranth, saltmeadow cordgrass, smooth cordgrass, and giant cordgrass was conducted at the Town of Oak Island greenhouse. Field (on-farm) trials were located at Wrightsville Beach, Oak Island, and Ft. Fisher. 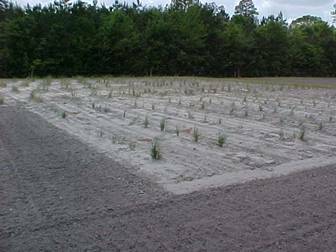 An estuary plant on-farm trial with a Brunswick County sea oats grower was conducted at his greenhouse. The demand for sea oats and other dune plants was exceptionally strong in 2004. Growers reported good sales of sea oats and other dune plant species. The research and extension education resulting from these projects provided growers with improved production methods. Fertility and disease management in the greenhouse continues to be areas of concern with growers. One on one consultations provided growers with knowledge to manage these problems resulting in improved plants with less use of both fertilizer and fungicides. A dune plant production meeting will be conducted in 2005 where growers will learn improved production methods that were gained through the greenhouse and field research studies. The demand for native, indigenous plants for conservation of the coastal dune system in North Carolina continues to increase. Dune plants are needed in large quantities for beach renourishment projects and to revegetate dunes following storm events. The impacts of hurricane Isabel along beaches in the northern part of the state generated a large demand for native dune plants in 2004 to stabilize and build coastal dunes. Nearly every coastal community in NC is currently seeking, or is already participating in, federally sponsored beach renourishment projects. Work by this agent previously funded by the Specialty Crops Program has resulted in new dune plant suppliers in North Carolina and has greatly reduced the amount of non-indigenous dune plants brought in from Florida and other dune plant producing states. The work with sea oats has been very successful and the research in progress needs to be continued. Production and marketing of other dune species needs to be investigated. The research on production of coastal estuary species that was initiated in 2003 was continued in 2004. More work needs to be done and shared with potential growers in NC. Future growers for dune and estuary plants include farmers with existing float-system greenhouses as well as coastal municipalities. Current research is underway with test plots at Wrightsville Beach, Oak Island, Ft. Fisher and the Castle Hayne Research Station. Participants include North Carolina State University, Louisiana State University, coastal municipalities, growers and North Carolina Cooperative Extension. By networking with the NC Coastal Federation, NC Sea Grant, public schools, coastal municipalities and other coastal groups, the impacts of the dune conservation and revegetation programs were mulitiplied. Marketing information focused on production of needed species and education of coastal property owners and managers. Individual contacts and consultations with growers, working with coastal municipalities, and public education programs were the primary methods used to educate clients. Field research to select for improved traits from more than 50 accessions of sea oats was continued. This was the second year of selections. These were transplanted to another field for further examination with selections to be made for increase in 2005. This research is being duplicated with field trials on the gulf coast by researchers at LSU. A selection of American beachgrass was increased in 2004 and further increased in January 2005. 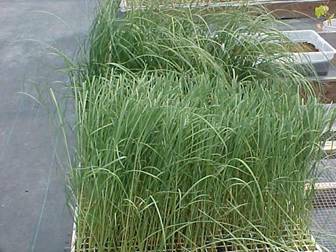 It may be possible to release a new named variety of American beachgrass as early as 2007. Replicated trials were conducted in the greenhouse to improve disease control, fertilization, and size management. Fertilization and clipping trials were conducted at Ft. Fisher and Oak Island respectively. Work in 2004 focused on continuing the research already underway. Selection of best-adapted indigenous sea oats will continued to be a high priority. Current field research also hopes to yield sea oats that will produce seeds in an agronomic setting thus reducing the need to harvest from coastal dunes. Field production of seeds may offer another potential crop for NC growers. Work with dune plants including sea oats, seashore elder, seabeach amaranth, and other species resulted in improved production protocols and marketing. Estuary plant species were investigated and production methods researched. Currently this agent is assigned to Brunswick, New Hanover, Pender, Onslow and Carteret Counties. This wide area of responsibility allowed for greater opportunities to network with both growers and users of dune and estuary plants. 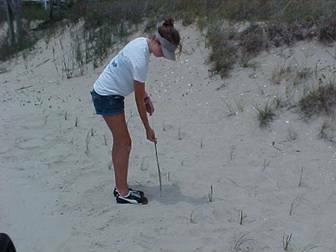 The past research and coastal management education efforts involving dune and estuary plants has yielded substantial results. Funding of this project by the North Carolina Specialty Crops Program enabled this agent to provide growers, dune plant installers, coastal municipalities and others with the knowledge and skills needed to protect and conserve the North Carolina coast while providing alternative income opportunities for those involved in businesses associated with these efforts. Sea oat trials at the Castle Hayne Research Station. Sea oats size management study examining clipping of plants while in the greenhouse floatbeds. Clipping study- investigating growth of sea oat seedling transplanted to the dunes.